Putting its 40 year audio heritage to work, Cambridge Audio is releasing its first ever soundbar this month. For the first time in its history Cambridge Audio is all set to release a soundbar - despite the TVB2 name sounding like a sequel. The audio specialist has used a pair of the same 4th Generation Balanced Mode Radiator (BMR) drivers it fills its flagship Aeromax 6 speakers with and the same that it's putting into its recently-announced wireless speakers, the Minx Air. That should allow the new TVB2 soundbar to generate some serious noise but, crucially for a discrete soundbar, will also deliver a room-filling, widely dispersed sound. Those two 46mm BMR drivers mean the TVB2 generates a full 120W of audio loveliness and, with the wireless (presumably Bluetooth) subwoofer coming as part of the package, it should also deliver a hell of a punch too. It's impressively connected as well. There are a full three HDMI inputs on the TVB2, but only a single ARC HDMI output. That means you can thread all your different A/V signals into the soundbar and only have to deal with a single line going into your TV. And that TV can happily be a sparkling new 4K Ultra HD unit too, because all three of the inputs have 4K pass-through too. But it's not all about the TV. 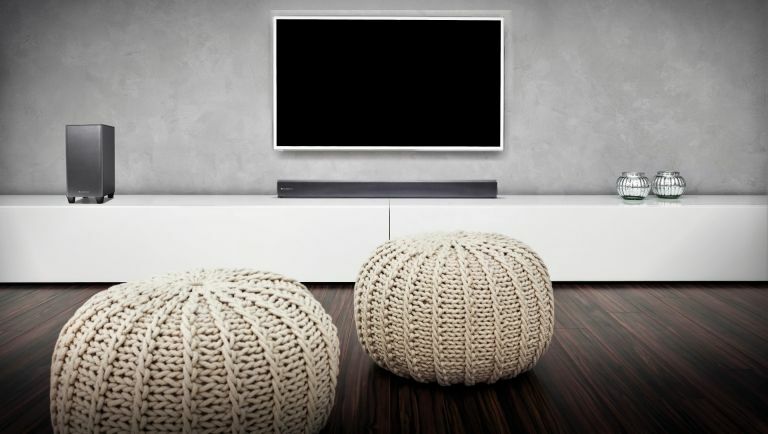 As is becoming standard with soundbars now they're not just being used to make up for the aural shortcomings of your slimline screen and its weak-heart speakers. And the same is true for Cambridge's TVB2. As well as standard optical digital and AUX analogue inputs the TVB2 is also rocking Bluetooth connectivity and one-touch NFC pairing too. There's also four separate EQ settings so you don't have the same beefy bass you'll crave for a Michael Bay flick ruining a Philip Glass classical piano number. The Cambridge Audio TVB2 is out this month from both Richer Sounds and John Lewis for £299.